If I would have to choose only one favourite cafe in town, it would be a tough choice but I would choose Velvet, the most extravagant and lush ambience for enjoying a delicious drink or snack. After having been closed for some years, this cult place reopened in 2009. It was decorated by Saša Šekoranja, a famous artist, florist and designer, who is also a co-owner. The interior, consisting of two rooms, is exuberant and fanciful: the wall covered with book shelves; minimalist abstract paintings in over-the-top ornate frames; chandelier in the toilet, an old street lamp standing by the stairs connecting the two rooms, casually stacked antique frames … It might sound random and chaotic, but everything is arranged deliberately and with taste. An especially delightful detail is that on every table there is an antique book – and when you open it, you’ll find the inserted menu. On warm sunny days, the terrace is also a good choice – the area is quiet and green (forest Tuškanac starts just a few steps away). The coffee and tea are top quality, and tasty snacks come in salty and sweet variants. 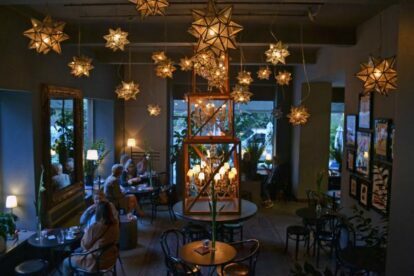 If I can take my guests to just one cafe, it’s always Velvet, especially on dark winter days – when the star-shaped lights brighten up the winter gloom and create a magical atmosphere.